Recently, a study, “Arsenic, Organic Foods, and Brown Rice Syrup” was released online in a journal published by the National Institute of Environmental Health Sciences. The study sent shock waves that resulted in articles in every paper in the country. It has been acknowledged and understood for quite some time now that arsenic contamination is a near-universal issue in rice, much the same way mercury contamination is a so common in fish. Of course we still eat fish. We just try and choose fish that’s as clean as it can be. The issue with rice is it’s a wet crop. It grows underwater. If the soil it’s grown in contains high levels of arsenic, that arsenic dissolves in the water, and then rice is very aggressive about absorbing it. However, not all rice is equal. A paper published in the April 1, 2007 issue of Environmental Science and Technology explored arsenic in 134 samples of rice purchased in retail stores in this country. The researchers tested brown rice and white rice, long grain and short grain, organic and conventionally grown, from both Louisiana and California. Not a single sample tested free of arsenic. However, the lowest level was found in a sample of organic brown rice from California; the highest level was found in a white, conventionally grown sample from Louisiana. 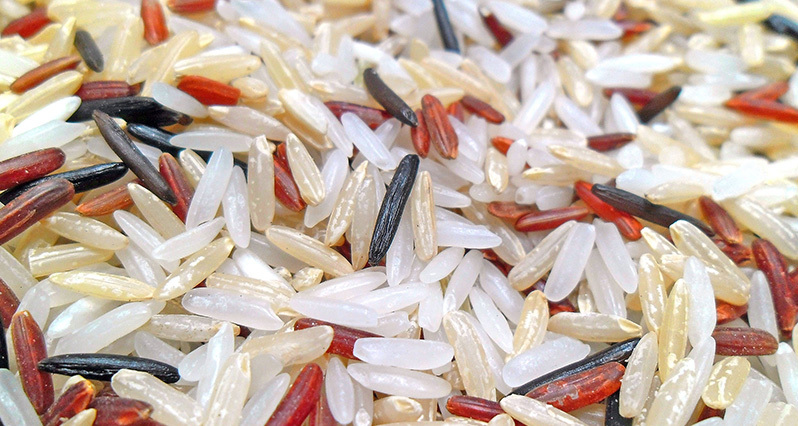 Organic rice tended to be cleaner than conventionally grown rice. Brown rice tended to be cleaner than white. However, the biggest predictor of arsenic levels was where the rice came from: California rices averaged nearly half the arsenic levels of Louisiana rice (0.3 ppm vs. 0.17 ppm). Turns out, much of the land used to grow rice today was historically used to grow cotton. Since cotton isn’t a food, it’s exempt from many regulations which limit the use of toxic pesticides. The most common pesticide for cotton contains high levels of arsenic. This can linger in the soil for decades. Don’t eat exclusively rice. Try buckwheat, millet, quinoa, amaranth, or teff instead. Minimize consumption of rice, and rice products during pregnancy and early childhood. Look for rice that is organically grown. Land has to be three years “clean” before crops can be considered organic. Three years isn’t much, but it’s a start. Look for well-established producers, who’ve been farming the land organically for longer. Look for rice from regions that do not have a long history of cotton production. California is a great start (so, Lundberg-brand rices). Also look to the exotic rices from Lotus foods, many of which come from areas where rice has been grown for centuries if not thousands of years. Some of our favorite rices from Lotus Foods are the Black Forbidden Rice, which was reserved for Chinese emperor and his family, and is said, today, to have more antioxidants than blueberries; the Jade Pearl Green Rice, wildcrafted and infused with bamboo (grown in CA); and Mekong Flower Rice, grown on small family plots by households belonging to the Damrei Romeal Organic Rice Cooperatives in Takeo, Cambodia where rice has been grown almost since time began. On the other hand, rice from Louisiana, Bangladesh, and regions of India is more likely problematic. Supplements derived from rice (rice protein powder, for example) tend to be safer, since supplements have to go through more rigorous lab testing than food.